Embroidery add an oh-so-cute personalized detail to baby quilts. Get your embroidery 15% off now until April 30th! Click here to shop. Simply click on the subtitle to access the link that goes straight to the pattern on our website. Once you download the free patterns and get started cutting with your GO! Cutter, you’ll realize just how easy and fun it is to piece together these adorable baby décor and quilt projects. Video tutorials for each pattern are available to offer tips and visuals so you know you’re on track. 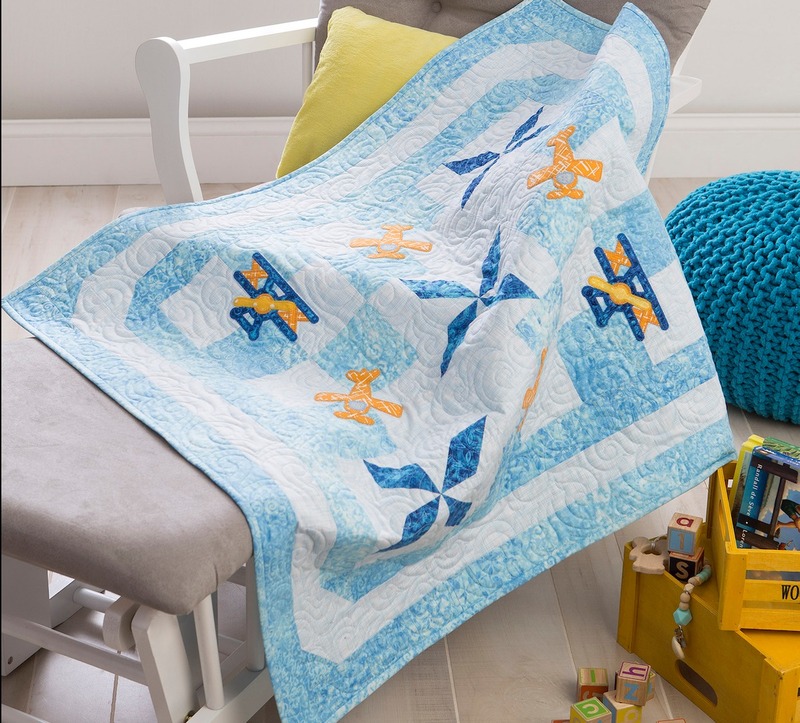 Airplanes, propeller blocks, and your imagination mean baby’s room will take flight with this quilt. Use your GO! cutter to make landing the angles on those airplanes and propellers a breeze. The quilt measures three feet square, which also makes it a great wall hanging. 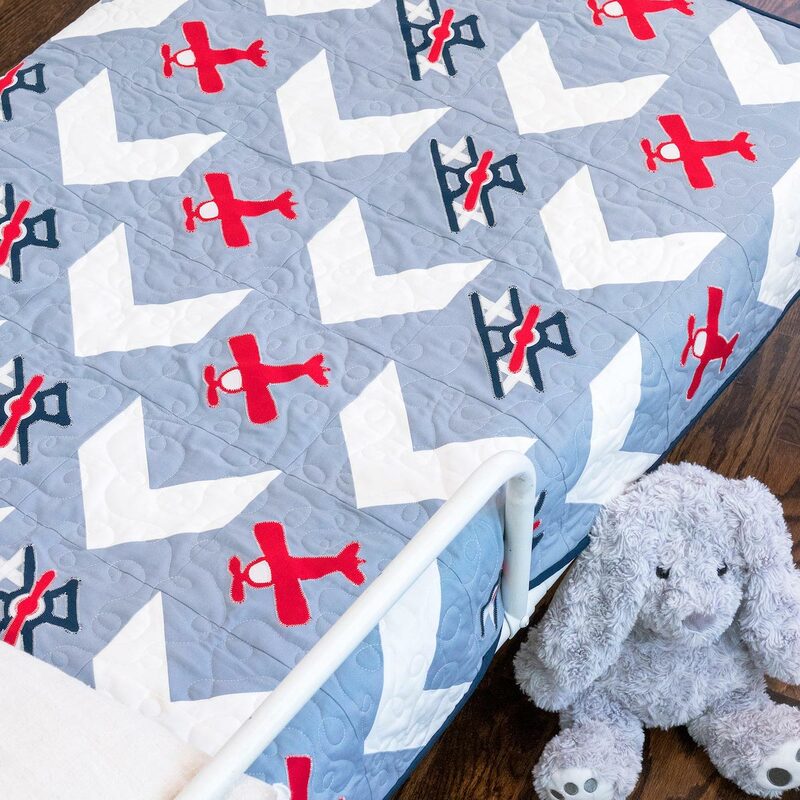 Marching chevrons, airplanes in mid-flight, and a crisp border make this quilt a handsome way to elevate baby’s aviation-themed nursery. It’s bold, graphic, and ready to be customized with your choice of fabric colors. The free downloadable pattern makes a 42" x 48” quilt, which fits nicely on a crib and is also large enough to be used as a floor play blanket for tummy time. 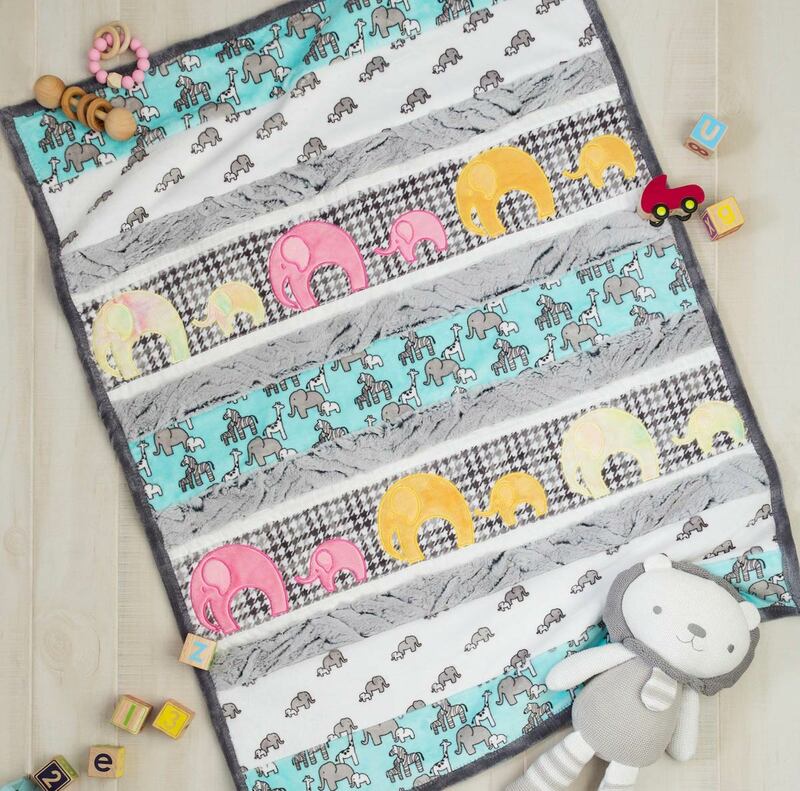 Our take on this adorable elephant quilt makes cuddle fabric into strips and a border for a sweet dose of softness. What will your version look like? This free pattern makes a 28" x 37” quilt. Parents will love the smaller size throw as it fits well in standard or mobile cribs and won’t catch on stroller wheels when on-the-go. Who wouldn’t love this owl wall hanging? It’ll charm both boys and girls for generations. The free pattern download lets you add character to the big-eyed owls as you can play with placing their eyes and wings. Simple squares let you build in color. There’s plenty of ways to personalize with appliqués and stitching. Bonus: Want more critters to join your owl? 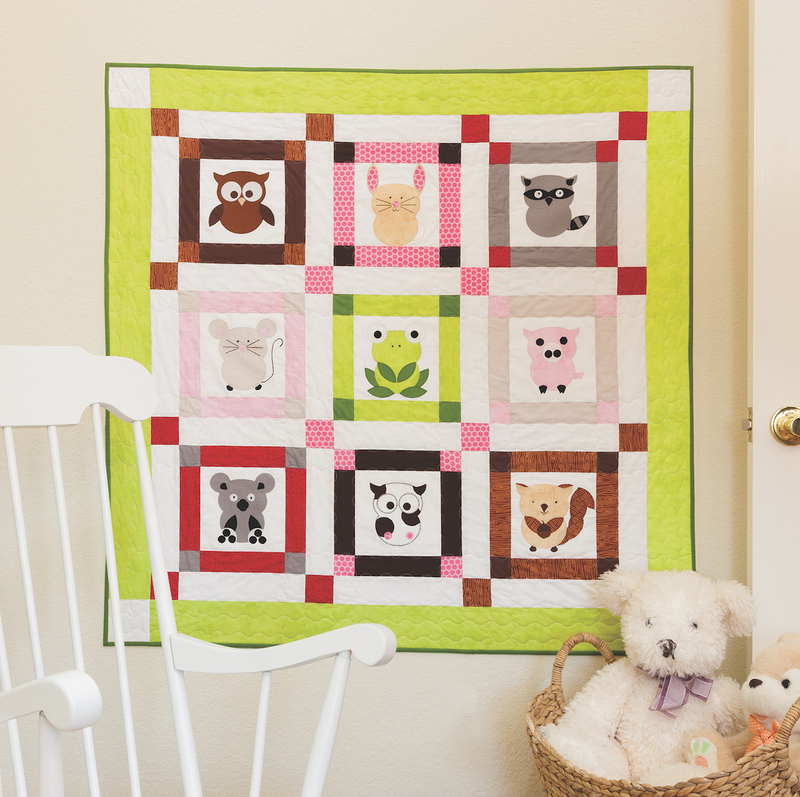 This Talk to the Animals baby quilt pattern has a ton of amazing animal ideas. Now that you’ve made it, present it with panache. Go simple by rolling your baby quilt neatly and finishing with a large bow. Go classic by placing your quilt gift in a large box with acid-free tissue and wrap it up in coordinating paper. For a gift that’s twice as nice, give your quilt in a reusable tote bag. Make this stylish GO! Big Pattern bag, which was designed by Vivian Peritts for AccuQuilt and featured in Modern Quilts Unlimited for a practical and pretty little extra for mom. Show Us Your Baby (Quilt) Pictures! Everyone is delighted to see pictures of your baby or grand baby, but we really want to see what you’ve created for that precious little one. Keep us in the loop by taking pictures of your baby quilt projects and posting to our social media or including #AccuQuilt. After all, sharing is the binding that keeps our quilting community pieced together. Find and follow AccuQuilt on Facebook, Twitter, YouTube, Pinterest, and Instagram.